Sometimes Postcrossing can seem like a fruitless desert of boring touristy postcards, but other times it's full of lovely surprises. This past week has certainly been the "feast" in the "feast or famine" cycle. Above we have the fabulous US-1779560 from the USA / New Mexico. 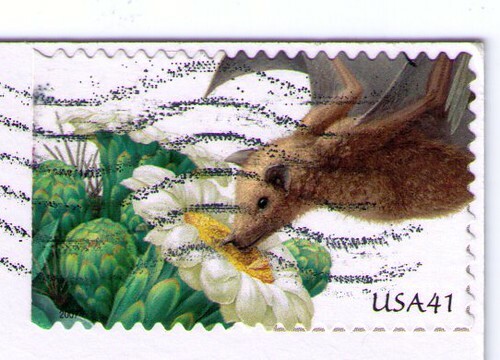 The sender, Dan, said he hadn't figured he'd ever be sending a bat postcard to a Postcrosser, but he'd picked it up because he loves nature. 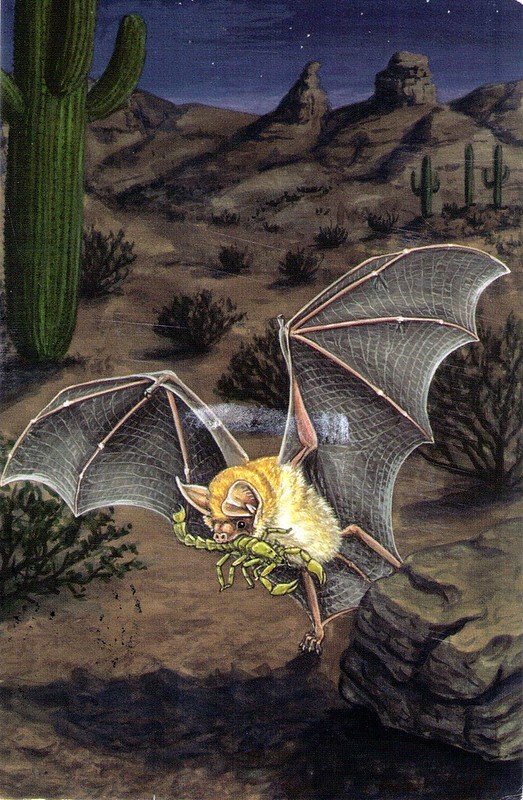 This is a southwestern desert-type bat with a scorpion in its mouth. LOVE! I really like the realistic yet colorful artwork, and of course the bat is wonderful. Dan was so thoughtful that he even used a bat stamp! This is from the "pollinator" series from a few years back... when the first class rate was 41 cents. Then, to continue another of my favorite themes, Helen in the Netherlands sent me NL-1328714 from the Netherlands. I hope you can tell by the size of this photo that the postcard is filled with wonderful dragons! 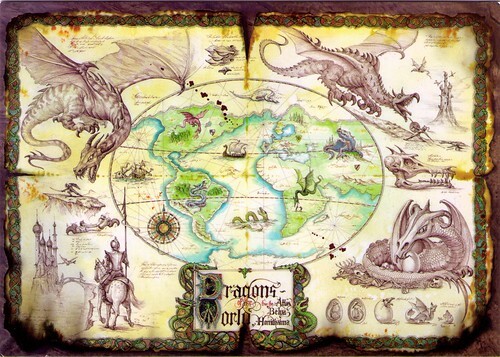 The dragons and knights are covering a fantasy-styled old map that looks to be burned at the edges, and the ornate text at the bottom reads "Dragons of the World." The postcard is called "Dragon Map" but I don't see any artist credit on it. Helen works in a bookshop and she loves to read. She mentioned that her son loves Christopher Paolini's Inheritance cycle, which is a dragon fantasy series. I loved that series, too. I've been spending a ton of time reading this summer. I always read a lot in the summer, but I've become completely engrossed in George R. R. Matin's "A Song of Ice and Fire" series. I started the first book, "Game of Thrones," at the beginning of the month, and read it in a week... and I was totally hooked. While on vacation I read "A Clash of Kings," and now I'm in the middle of the third book, "A Storm of Swords." I am completely, totally loving it - one of the best fantasy series I've ever read, I think, and I've read a lot of them! - but it is, of course, eating up a lot of mail time. But it's the summer and I've got a fair bit of time, and I am loving the luxury of hanging out in my hammock chair for hours at a time, getting lost in a good book. So I note all that side literary information by way of explanation, and perhaps apology, for why I've not been blogging as much! So for now, go write a letter or read about dragons, and have a lovely Sunday. Ah! I got so excited when I saw the words "A Song Of Ice And Fire". I watched the TV series and when the second series finished I got impatient to find out what happened next and started reading the books. I am still only part way through book 3 and have had to put it down to do uni work. Have you seen any of the series? I think they really go hand in hand - I like the books and show equally. I got your lovely card last week and am again trying to fill up the envelope I decorated for you months ago! It was so lovely to receive, I really appreciate it and I will get writing to you again soon I hope. Bianca, maybe we're in the same place - I'm partway through book 3 right now, too, but I admit I'm spending a lot of time reading it. I haven't seen any of the series, and it's funny you should ask, because that's what got me reading the books. A dear friend loves the series and keeps telling me how wonderful it is and how much I'd love it, so I decided I wanted to read the books before I watched the shows. I figure it will be a good palliative, since the whole series - although 5(?) books now - still isn't finished, so whenever I finish the books, I can turn to the movies. Glad you liked the card, no rush to respond. How wonderful postcrossing cards you have received!